The surprising finding is being reported this week in the journal Science, in a paper by senior author Ming Dao, a principal research scientist in MIT's Department of Materials Science and Engineering; MIT postdoc Daniel Bernoulli; senior author Subra Suresh, former MIT dean of engineering and now president of Singapore's Nanyang Technological University; graduate students Amit Banerjee and Hongti Zhang at City University of Hong Kong; and seven others from CUHK and institutions in Ulsan, South Korea. Ordinary diamond in bulk form, Bernoulli says, has a limit of well below 1 percent stretch. 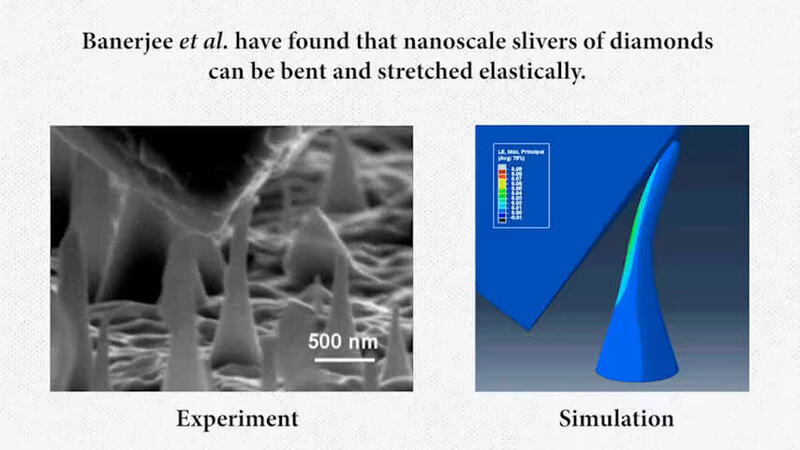 "It was very surprising to see the amount of elastic deformation the nanoscale diamond could sustain," he says. "We developed a unique nanomechanical approach to precisely control and quantify the ultralarge elastic strain distributed in the nanodiamond samples," says Yang Lu, senior co-author and associate professor of mechanical and biomedical engineering at CUHK. Putting crystalline materials such as diamond under ultralarge elastic strains, as happens when these pieces flex, can change their mechanical properties as well as thermal, optical, magnetic, electrical, electronic, and chemical reaction properties in significant ways, and could be used to design materials for specific applications through "elastic strain engineering," the team says. 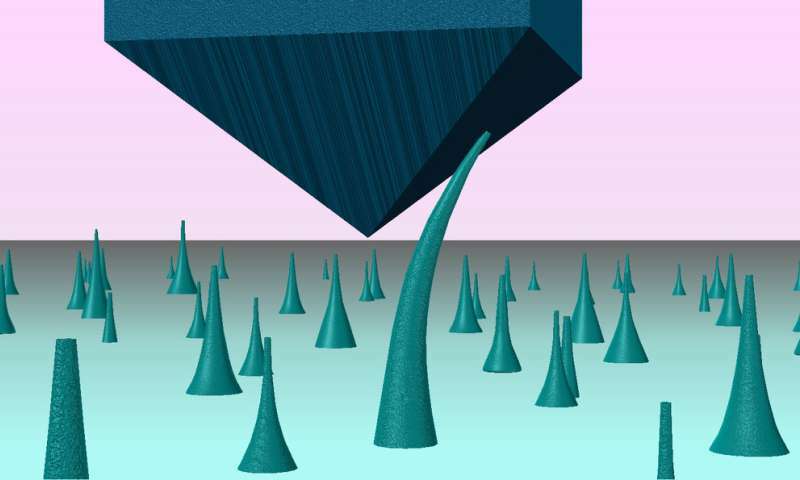 The researchers also developed a computer model of the nonlinear elastic deformation for the actual geometry of the diamond needle, and found that the maximum tensile strain of the nanoscale diamond was as high as 9 percent. The computer model also predicted that the corresponding maximum local stress was close to the known ideal tensile strength of diamond—i.e. the theoretical limit achievable by defect-free diamond.